The first thing you connect with garden snails is usually not speed. 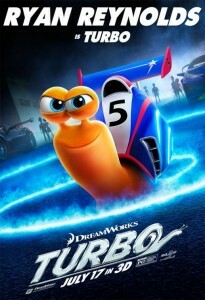 So when a movie comes out about a snail who dreams of winning the Indianapolis 500 (yes, the human race car version) it’s pretty intriguing. The fine folks at DreamWorks who brought us Shrek, Antz and How to Train Your Dragon continue to hold their own against the likes of Disney-Pixar, who has set the bar high when it comes to animated features. With vibrant colors, beautiful animation, as well as a fun and heartfelt script, Turbo kicks things into overdrive at the theater this summer. Theo (Ryan Reynolds) loves racing, and spends most of his free time watching reruns of old races on VHS tapes. He wants nothing more in life than a chance to race with the best, his hero and role-model Guy Gagné (Bill Hader) who says, “No dream is too big, and no dreamer is too small.” The only problem is that Theo is really, really small: because he’s a garden snail. He spends his days “racing” around the garden tending the tomatoes, calling himself “Turbo” as his brother Chet (Paul Giamatti) and the other snails only tease him for his silly dream. After he runs away from home, a quickly passing truck blows Turbo off his path and straight into an underground street-race. In a freak accident he is submerged in nitrous oxide, and is given the magical power of speed. After being banished from the garden, he and Chet end up at a run-down strip mall where Tito (Michael Peña) and his fellow store owners happen to hold snail races. There they meet a group of snails who also share a need for speed, comprised of: Whiplash (Samuel L. Jackson), Smoove Move (Snoop Dogg), Burn (Maya Rudolph), Skidmark (Ben Schwartz) and White Shadow (Mike Bell). They all work together to help him realize his dream of making it to the Indy 500, while Tito’s brother Angelo (Luis Guzmán) thinks the idea is crazy. It is hard to imagine what the film will actually be about, knowing the general premise. How could a snail possibly race alongside cars going 250 MPH? Once you realize that the film is complete fantasy, things make a whole lot more sense. There is no rational explanation for Turbo’s powers – they are magical. And that makes things a whole lot more fun than if he simply built some kind of racing device, or became a part of some under-ground secret world beneath the tracks of the Indianapolis Motor Speedway. The creators built a world where magical things can happen, and there are some people that believe in them. The movie has a lot of heart, and it was refreshing to see such a unique spin on an animated film set in the real world. The animation that DreamWorks does is top-notch in the film, and holds it’s own against any of the other studios out there. The film is bright and colorful, with a style of its own – while also remaining detailed and life-like. I think we really saw what they could do with How to Train Your Dragon, which looked incredible, and Turbo is no exception. Not only was the animation fluid and realistic, but it was also directed like it was a film. There is a diverse array of shots that make it look like it was filmed with a camera. They chose a lot of interesting angles, and would pan in and out and go around corners. I was really impressed with the way it was presented, which added a lot to the feel of the movie. Turbo is a fun family comedy with a lot of laughs, but also a lot of heart. The story, while fun and goofy, also carries with it a good message about following your dreams. In true DreamWorks fashion, there is plenty to keep kids entertained while maybe even more for the adults. The film looks fantastic, has great voice talent, and a fun story where your imagination can run free. It’s a great chance to take the whole family to the theater this summer and find something that everyone can enjoy.